First Capital Research expected the yield curve to be upward trending 1Q-3Q2018 with an acceleration in the uptrend towards 3Q amidst bunching of debt maturities during 3Q2018. The unexpected local polls victory by the opposition resulted in an early surge in yields across the yield curve in March 2018 with low level of investor confidence. Following the $ 2.5 b sovereign bond some stability was seen during April 2018. However, business confidence dropped to a 70-month low in April 2018. Contrary to the prevailing uptrend in yields, compared to other tenors, the shorter tenors registered a continuous dip in yields with investors expecting a further rise in the overall yield curve. PC elections on the cards: Following the Local Government elections, all eyes are on Provincial Councils which are in the process of expiring. Sabaragamuwa, North Central and Eastern PCs expired in 2017. Central, North Western and Northern PCs terms will expire in Oct 2018. Southern, Western and Uva PCs terms will expire on 10 April 2021 and 8 October 2019. With the new electoral system to be finalised for PCs, Elections Commissioner has not called for nominations as yet. A further defeat for the present Government may worsen the prevailing political uncertainty. But an improvement in the voter base may provide some respite. No announcement of presidential candidate: Another major factor that is creating uncertainty is the upcoming presidential election in late 2019. None of the three major political parties have announced a clear candidate who would be contesting for the upcoming elections. It is a major deterrent for any investor. It is an important step in forecasting possible policy direction for the future in order to assess the risk for long term investments. GDP growth for 2018E downgraded to 4.5%: 1Q2018 GDP growth which recorded 3.2% was below expectations suggesting a slower than expected improvement in economic growth. Similarly, 2Q is also likely to be slow amidst business confidence levels falling to a 70-month low. However, we expect a gradual pickup in business activity and consumer demand during 2H2018 with an acceleration in GDP growth towards 4Q2018. 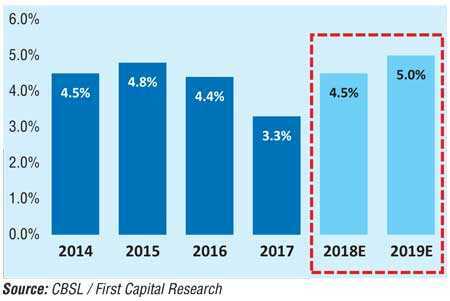 First Capital Research has downgraded 2018E GDP growth to 4.5% (previous 5.1%) but remains positive on uptick in growth specifically during 3Q and 4Q of 2018. 2019E GDP growth to accelerate to 5.0%: Stronger macro fundamentals, higher investments and pickup in consumer demand is likely to increase growth in 2019E to 5.0%. Potential election in 2019E may also push authorities accelerate relaxation of para tariffs which may also support stronger consumer demand. Foreign reserves jumps back up, but so does imports: The $ 2.5 b Sovereign Bond has resulted in jump in reserves back up to $ 9.2 b by Jun 2018. Despite large outflows, final payment of Hambantota Port deal of $ 0.5 b and syndicated loan of $ 1 b is likely to assist reserves to remain above $ 9 b by end 2018. However, growing imports have resulted in an increase in the minimum amount of reserves required (four months of imports) to $ 8 b. Further foreign reserve accumulation need to continue amidst the continuous rise in foreign debt payments (large sovereign bond repayment 1Q and 2Q 2019) and BoT deficit. Debt repayment cover improves: Rise in foreign reserves has further lowered the foreign currency debt repayment cover to 1.3x of foreign reserves. 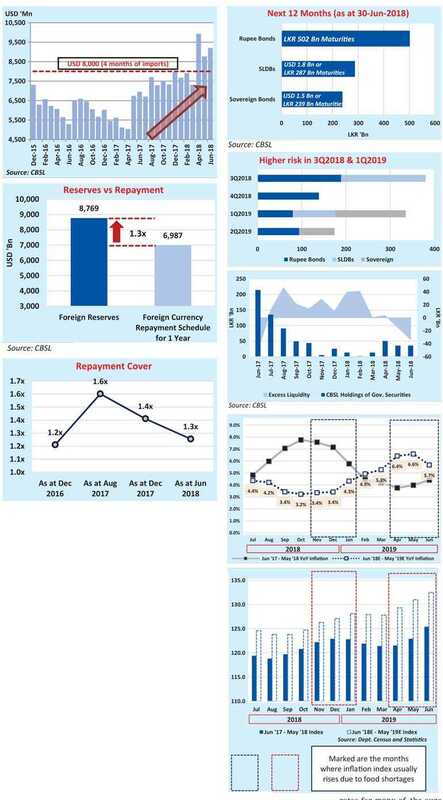 The strengthening of reserves have improved the foreign currency repayment cover at a time, when the next 12 months is having the highest level of foreign debt payments before overall debt levels start to ease off. Beyond 1H2019 overall debt payments to ease off with less bunching off of debt while debt to GDP levels are likely to be on a downtrend: CBSL has so far been very successful in rolling over most of the debt and spreading them over a period to prevent any bunching of debt in the future and also reducing the cost of debt at the same time. We expect Debt to GDP to reduce to 76.5% in 2018E while any SoE selloffs (such as Hyatt or Hilton) and PPPs for Mattala Airport works off the ratio is likely further dip below 76.0%. Liquidity may improve towards 4Q: In line with our expectations in Jan 2018 through ‘First Capital Strategy Report 2018,’ we are experiencing a liquidity shortage towards 3Q. We expect the shortage to continue and ease off towards 4Q2018, but low level of liquidity of Rs. 20-50 b is likely to be experienced during 1H2019. 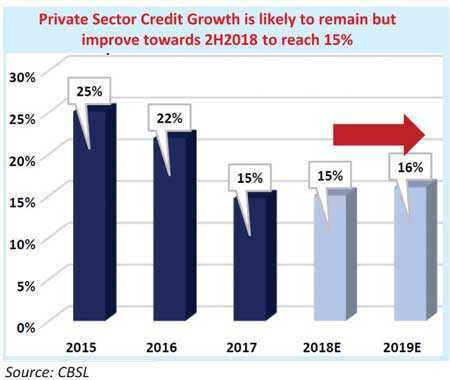 Credit to remain steady at 15%: First Capital Research expects private sector credit growth to pick up towards 2H2018 signifying a steady growth of 15% while 2019E is expected to record a moderate growth of 16%. Global growth and South Asia growth is positive: Global growth indicators have been consistently providing positive feedback resulting in IMF continuously upgrading its global growth forecasts for 2018. In January 2018 it has been further upgraded to 3.9% for both years 2018 and 2019. Upgrades are driven by improved US growth and surprises in growth in Europe and Asia. Growth rates for many of the euro area economies have been marked up, especially for Germany, Italy, and the Netherlands, reflecting the stronger momentum in domestic demand and higher external demand. It’s positive with Sri Lanka regaining GSP+ and export growth momentum picking up over the last few months. Emerging and developing Asia will grow strongly at around 6.5% over 2018-19, broadly at the same pace as in 2017. Funds flows are towards US is negative for Sri Lanka: Higher growth across the world is likely to create significant competition for capital and investments which is negative for Sri Lanka. Further the rising global yields supported by further Fed rate hikes have resulted in global funds flowing towards the US. 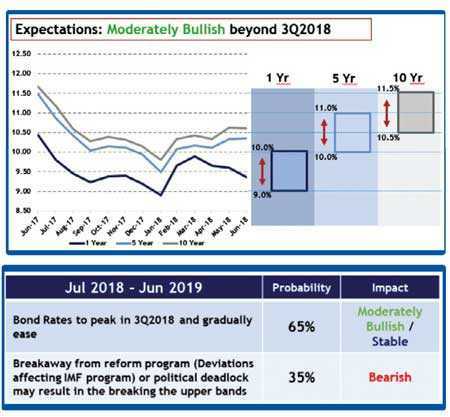 Overall impact is neutral: Despite rising global yields the improving macro conditions neutralises the overall outlook for Sri Lanka unless reform agenda is reversed. We expect the yield curve in Government securities to peak during 3Q in 2018, and register a slow downtrend. Despite having some pressure in 1Q2019 it is not expected to be as high as 3Q2018. Thereby, from bearishness at the start of 2018, we are now bullish on bonds beyond 3Q2018. We believe 1Y, 5Y and 10Y trade within the bands of 9.0%-10.0%, 10.0%-11.0% & 10.5%-11.5%. However, it should also be noted that any breakaway from reform program (deviations affecting IMF program) or political deadlock may result in breaking the upper bands of the tenors. Banking rates which has a six-month lag effect to Government securities are likely experience less volatility over the next 12 months while a further slow dip in AWPLR is expected over the next 12 months to 10.0%. Five-year bond bottomed out in mid-January 2018 at about 9.4% thereby AWPLR is likely to further decline during July-Aug 2018 while it is expected to rise to 10.4% towards the end of the year. Despite the marginal rise towards 2H2019E AWPLR is expected to dip again to 10.0%. In a broader sense during the next 12 months (Jul 2018-Jun 2019), we expect AWPLR to broadly stay within the band of 10.0%-11.0%. With four fed rate hikes on the cards over next 12 months, a stronger dollar is more likely, thereby we downgrade our exchange rate target from Rs. 159 to Rs. 161 : 1 USD for end 2018 and target Rs. 164.5 : 1 USD over next 12 months up to June 2019. Dollar index is expected to remain strong over the next 12 months while with continued reforms inflows into Sri Lanka debt and equity capital markets are likely with the attractive yields. Further Sri Lanka moves into the peak season of exports September-March. We expect more stability in the rupee in 2H2018, but downgrade our target to Rs. 161. With stable interest rates and low inflation, we expect the stability of the economy to further improve during 2018. The stable environment is expected to slowly improve business confidence and consumer demand towards 2H2018. We believe business confidence and consumer demand are currently below average and they are expected to normalise during the period. However, the prevailing policy uncertainty created through the political uncertainty is a major deterrent which may slow down the gradual improvement.